Follow Breitbart News for live updates as FBI Director James Comey testifies before the House Intelligence Committee. 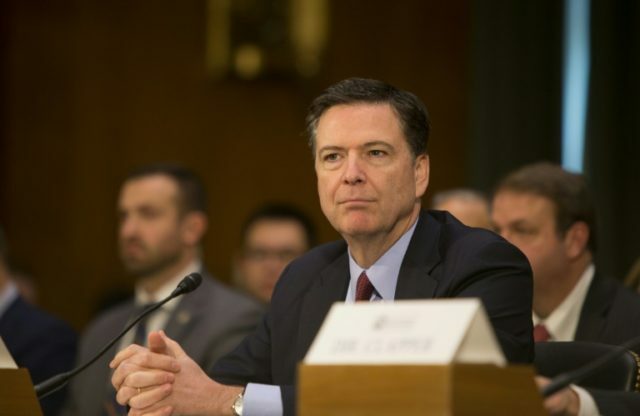 Comey is expected to address two controversial topics: President Donald Trump’s claim that former President Barack Obama wiretapped Trump Tower during the 2016 presidential campaign, and allegations of collusion between the Trump campaign and the Russian government. 3:19 PM: Gowdy asks Comey several questions on basic concepts of law, such as what hearsay is and why we have cross-examination of witnesses. Gowdy states that many of the accusations presented by his Democratic colleagues are hearsay and would not be admitted as evidence to a trial — also expresses frustration that anonymous sources cannot be cross-examined. 3:10 PM: Rep. Will Hurd (R-TX) gets Comey and Rogers to restate that neither the FBI nor NSA ever had direct access to the DNC’s machines for firsthand examination of forensic information on those devices to compare to the conclusions from CrowdStrike. 3:06 PM: Rep. Castro asks Comey if the leaks could have come from (Trump’s) White House staff instead of the intelligence community. Suggests those leakers could have “a political Munchausen by proxy syndrome” and want to create a mess that only they can clean up. 2:45 PM: Rep. Rick Crawford (R-AR) asks if private citizens and members of a presidential transition team are required by law to report interactions with foreign officials. Rogers says he is unsure of the law on that point. 2:25 PM: Rep. Joaquin Castro (D-TX) wants to talk about the Christopher Steele dossier. Comey does not. 2:20 PM: Basic bloggers perking up. Comey: "I hate the New England Patriots…" He's good now. 2:15 PM: Comey tells Rep. Chris Stewart (R-UT): We did not make any conclusion as to the success of the Russians’ efforts. 1:39 PM: Comey asks for a bathroom break. 1:30 PM: Turner asks Comey to create some kind of mechanism to correct misinformation about classified info. Comey says that if he got into the practice of correcting such stories, any time he did not correct them, it would be seen as a confirmation of the story. 1:27 PM: Rep. Turner asks Comey if it is a crime for attendees at an intel briefing to lie to reporters about the classified content of that meeting. Comey says no. 1:19 PM: Rep. Eric Swalwell (D-CA) tries to get Comey to say that Trump’s “wiretap” tweet is “false.” Comey disagrees and reiterates that he does not have evidence suggesting Trump’s claim was correct. Comey notes he has not said "collusion" today — as a "legal term of art" — but the FBI is investigating "coordination." Comey just made a really important point about "co-optees," who don't realize they are working for a foreign government. "You can do things to help a foreign nation state without realizing it." Comey: "Romance can be a feature" of foreign intelligence gathering. AKA the "honey pot"
1:09 PM: Rep. Speier now on Michael Caputo, Roger Stone, and Gazprom. “Any thoughts?” she asks both Comey and Rogers. 1:05 PM: Turner tells Comey “there is a cloud over our system” with the announcement of this investigation after former DNI Clapper said there is “no evidence of collusion” between Russia and the Trump campaign. 1:01 PM: Rep. Mike Turner (R-OH) gets Rogers to admit that the NSA is not required to cease surveillance if its surveillance incidentally picks up communications from an American citizen. Comey: "They (Russia) were unusually loud in their intrusion. It was almost as if they didn't care that we knew about their intrusions." 12:50 PM: Trump’s @POTUS account continues trolling the far left. 12:48 PM: Rep. Jackie Speier (D-CA) asks Comey and Rogers about Rex Tillerson in relation to the Trump-Russia conspiracy. Both say that they are not in a position to discuss whether Putin benefits from Tillerson serving as Secretary of State. Speier, California Dem, trying to get Comey & Rogers to disparage Tillerson on Russia ties, neither of whom want to go there. Q from @RepSpeier: Is Russia our adversary? 12:40 PM: Rep. André Carson (D-IN) asking Rogers how much Russia’s economy would benefit from the U.S. lifting sanctions. 12:35 PM: Rogers declines to discuss the specific methods of Russian cyber attacks. King grills Comey over dossier briefing. Comey refuses to confirm even the existence of the meeting. 12:26 PM: King asks Comey specifically about his presentation of the Steele dossier to president-elect Trump and how details of that meeting leaked to reporters within hours. Comey says that, in general, leaks at this level should be investigated and, if possible, prosecuted. 12:25 PM: Rep. Peter King says he has “never seen such a sustained period of leaks” during his time in Congress. "I've never seen such a sustained period of leaks," Rep. Steve King says of journalists' reporting on Trump and his associates. 12:22 PM: Nunes says the IC changed its assessment between December and January — that in December, it only claimed the Russians wanted to hurt Clinton and in January, the assessment added the detail about hoping to help Trump. Both Comey and Rogers sharply contest this claim. 12:13 PM: Sewell asking Rogers how long the NSA has known that the TV network RT is connected to the Russian government. 12:08 PM: Rep. Sewell monologuing, with Comey punctuating her thoughts in terse “I can’t comment on that” statements. 12:06 PM: Rep. Schiff is asking Comey whether Russia likes NATO and Brexit. 12:02 PM: Conaway asks why the Washington Post printed language in December that reads almost identically to the IC’s January report on Russian interference. Comey says that none of the authors of the Washington Post article containing that language helped draft the IC report. Conaway then wonders how they got such a prescient scoop, heavily insinuating that an intelligence official illegally gave them that information. 11:58 AM: Rep. Mike Conaway (R-TX) asking how the IC determined the intent of the Russian government in its cyberattacks — particularly the belief that it hoped to hurt Clinton’s campaign and help Trump’s. Comey and Rogers stand firm in that assessment, arguing that Putin so disliked Clinton that it logically follows that he held a “clear preference” for Trump. 11:50 AM: Rep. Nunes asking if Comey would consider information regarding Russian interference into Hillary Clinton’s campaign, the Clinton Foundation, or any other campaign. Comey says he would consider any information brought by parties alleging illegal activity. Trey Gowdy far more concerned with role of reporters in revealing details of FBI investigations than Russia's role in hacking 2016 election. 11:39 AM: Comey says he cannot comment on a line of inquiry about Paul Manafort and Ukraine. 11:37 AM: Rep. Himes very concerned by Trump not saying mean things about Russian President Vladimir Putin. Comey: Russians used "some kind of cutout" between Wikileaks rather than directly dealing with them. 11:30 AM: Gowdy asks Comey to assure the American people that he takes the leaks seriously enough to investigate them. Comey says he cannot make that commitment at this time. 11:26 AM: Gowdy asks if the White House can put in a request to the NSA to “unmask” or identify a U.S. citizen in collected data. He then asks, one by one, whether several Obama political appointees had the ability to make such a request. Among those names, Comey says that Susan Rice and Loretta Lynch could make such a request. Gowdy then asks Comey if, in theory, he would have similar access. Gowdy is asking Comey about potential sources for Flynn stories, specifically naming Clapper, Brennan, Ben Rhodes and Loretta Lynch. 11:18 AM: Rep. Gowdy asks Comey whether a reporter may face criminal penalties for publishing classified information — specifically whether there is any exception in federal law for reporters to publish such information. Comey says he does not know of such an exception and cannot think of a legal way that reporters would have received knowledge of still-classified information. 11:16 AM: Rep. Terri Sewell (D-AL) asks several questions too specific for Comey to answer. Settles on asking him how, in general, these investigations proceed and how long they “usually” take. 11:13 AM: Rep. Jim Himes (D-CT) asks Comey how far along his investigation is. Comey says the FBI’s investigation began in late July. 11:11 AM: Schiff is now asking Comey about Roger Stone. Comey says he does not want to discuss any information about specific individuals. 11:08 AM: Schiff asks and Rogers denies that Obama asked British intelligence to conduct surveillance on Trump and/or his associates. 11:03 AM: Schiff begins asking Comey to comment on Trump’s tweets alleging Obama ordered a wiretap of Trump Tower. Comey says there is no evidence to support Trump’s specific wording in those tweets. 11:00 AM: Rep. Trey Gowdy (R-SC) begins by reading back establishment media reports on “wiretapped communications” about Trump associates. Comey says he will not comment specifically on those leaks to reporters but says that, in general, leaks of classified material are a serious crime. 10:55 AM: Rogers reveals up to 20 people in his agency would have the authority to reveal the information that led to the leaks on Lieutenant Gen. Mike Flynn. Rogers, re: leaking: "I have raised this directly with my own workforce" over past several months. 10:40 AM: Rep. Tom Rooney (R-FL) asks Adm. Rogers about the NSA’s information gathering practices, teeing up denials that the agency improperly collects or uses data regarding U.S. citizens. Rogers/Comey being asked, state by state, if there is evidence of interference with election day vote tallies. Answer for all: No. 10:32 AM: Comey statement confirms that the FBI is investigating Russian interference into the election including links to members of the Trump campaign. He says the investigation could lead to criminal charges but he will not comment any further. 10:31 AM: Rogers assures the committee that the NSA is properly protecting the privacy of the information it gathers. 10:27 AM: NSA Director Admiral Michael Rogers says that nothing has changed from its January assessment of Russian hacking and the classified information used for that assessment will not be revealed in this open hearing. Apparently, according to @RepAdamSchiff, @BreitbartNews is part of the *GLOBAL RUSSIAN CONSPIRACY*. Fitting for tin foil hat this afternoon. 10:23 AM: “Pro” journalists speculating that Schiff’s liberal use of the Steele dossier means that U.S. intel corroborates it. 10:22 AM: Schiff now asking “is it a coincidence” that Sen. Jeff Sessions saw a Russian ambassador in his duties as a U.S. Senator. 10:17 AM: Schiff is now credulously recapping the allegations from British spy Christopher Steele in the infamous “dossier” published by BuzzFeed. 10:14 AM: Schiff suggests that the individuals testifying today may not confirm in an open hearing whether there is an FBI investigation into Trump or his associates. 10:09 AM: Rep. Adam Schiff (D-CA) says the conclusion that the Russian government was the source of Wikileaks’ releases on the DNC and the Clinton campaign is not disputed. 10:08 AM: Nunes says there is no evidence of a “physical wiretap” of Trump Tower but remains open to the possibility of other types of surveillance against the Trump campaign and its associates. 10:03 AM: All parties are present and Comey begins his swearing-in.